The HMS Invincible, a British carrier which participated in the Falklands War, is about to become a nightclub. It was decommissioned and supposedly kept in drydock in Plymouth, ready to rejoin the fleet if necessary, but that is probably a pipe dream. It has been stripped of it's engines and other important equipment for spares for the last two remaining carriers, the HMS Ark Royal and the HMS Illustrious. These two carriers are also scheduled to be retired soon. The Invincible was built by Vickers Shipbuilding and Engineering, in Barrow-in-Furness in 1973-77 and was almost sold to Australia till the Falklands War interceded. The British kept her, and she was involved in the Iraq War, and the UN operation to enforce the no-fly zone over Bosnia. She underwent a major refit and was almost instantly mothballed since 2005 and is now for sale for scrap or whatever. That whatever may be Chinese businessman Lam Kin-Bong who plans to make it a nightclub, mooring it in Liverpool or possibly Zhuhai, China. The UK Government would probably have a fit if it went to China. 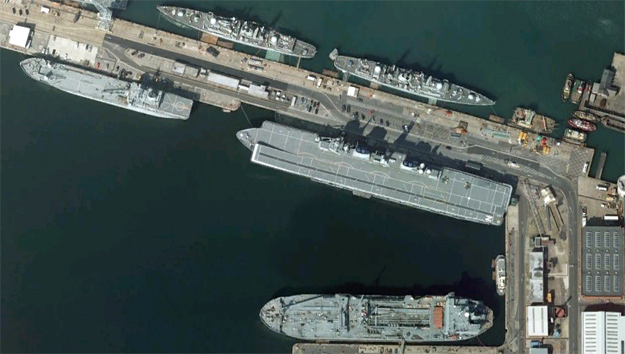 Britain has 2 Supercarriers being built, the HMS Queen Elizabeth and the HMS Prince of Wales, with one of the two to be mothballed soon after completion. Sometimes you just can't throw money away fast enough.